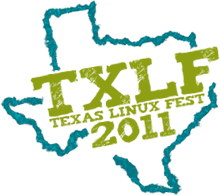 If you're anywhere around the Austin area on April 2, 2011, I hope you'll join us at the Hilton in downtown Austin for the 2nd annual Texas Linux Fest! Last year's conference was a resounding success with a tremendous turnout. I'll be there again this year, where I'm giving a fun and exciting presentation and real-time demo. Here's the abstract. Hope to see you there! Byobu -- a Damn Fine Command Line! consider learning Byobu, the text window manager based on GNU Screen. of your damn fine command line. I'm excited to see byobu presented again. I use it all the time :-) Hope to see you back again at TAMULUG!